I only have a minute but this was probabbaly one of my most epic days of billfishing. Had a NNE wind all day at 15 k it’s and it was game on from Devils Point to Dolphin head 3 days today after the Full Moon. We went on to release 2 blue marlin, 5 white Marlin, and 4 sailfish, along with keeping 8 mahi! Amazing day of fishing. 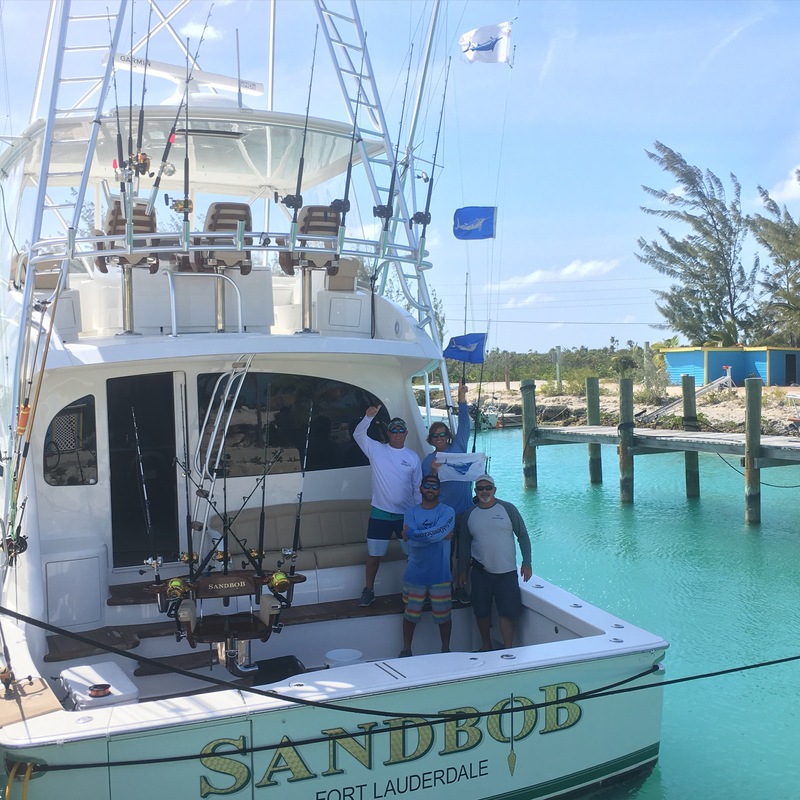 Check out the video of the day we caught the Grand Slam on the Party Hats and Skirts aboard the 66′ Viking SandBob and be sure to watch in HD. Today a mated on a beautiful classic 53′ Hatteras from the late 70s. We had a stiff 20 knot wind out of the SE and we pretty much went out the cut and put lines in. The dolphin were everywhere. We whacked a bunch of dolphin early and then moved around looking for some billfish bites. We did see a tailing blue marlin that never came into the spread, then had a white pile on the right short rigger all black Mold Craft Wide Range and sting himself but didn’t stay on. Other then that, the day was full of whacking dolphin in the 12-25 pound range. We kept 14 and had some fun watching the whitecaps go crazy chasing the dolphin around. Today I fished on a 66′ Viking that just arrived here in Cat Island and th fishing was great. We caught a couple of mahi, went 1/1 on blue marlin, 2/4 on white marlin, and 1/2 on sailfish for the Grand Slam. We caught all of our fish from the Hawks Nest Cut to Dolphin Head mostly in 1000-1500 feet of water and had a hard NE of 15-20 knots all day but the SeaKeeper kept it comfy all day. Fun day of fishing. We also had quite a few tunas on but just fed the Sharks with them. The fishing here in Cat Island remains to be pretty hot! The dolphin re definitely here thick and they are nice ones averaging in the lower twenty pound range. Seas were calm again and the fish were biting! We started off the day between dolphin head and Devils Point and got into some action with mahi. In one of those flurries we had a sailfish sneak up on us on the turn and unfortunately we missed that one. We worked our way down to Dolphin Head and raised a blue marlin on the right mud flap dredge and in the turn a white Marlin came up on the left teaser of Squidnation electric blue squids with a Pakula/ballyhoo chaser. The white switched off to every bait in the spread and made Joe dance from rod to rod before the white finally ate the dorado Party Skirt that wasn’t in his hands be we missed that one. A customer was reeling in the head of the ballyhoo that was left and the Party Skirt and wham! A small blue marlin piled on but didn’t come right. Chaos and frustration, hahaha. We kept working our way down after a bunch of passes on the previous bites and got down to the turn out at Columbis Point and we had a double header sailfish pop up. We managed to get a hook into one of them and got a clean release. We fired the baits back out and immediately we got a double header of nice 40# yellowfin tunas on. One was eaten by the Cat Island Tax man, but amazingly we were able to slip one by the 6 whitetip Sharks waiting for a meal. The afternoon was slow for us overall but we did pick at some more mahi and had plenty of fun all day! Today we had calm seas and light winds out of the SE here in Cat Island. The weather has been absolutely beautiful, sunny and 80s. 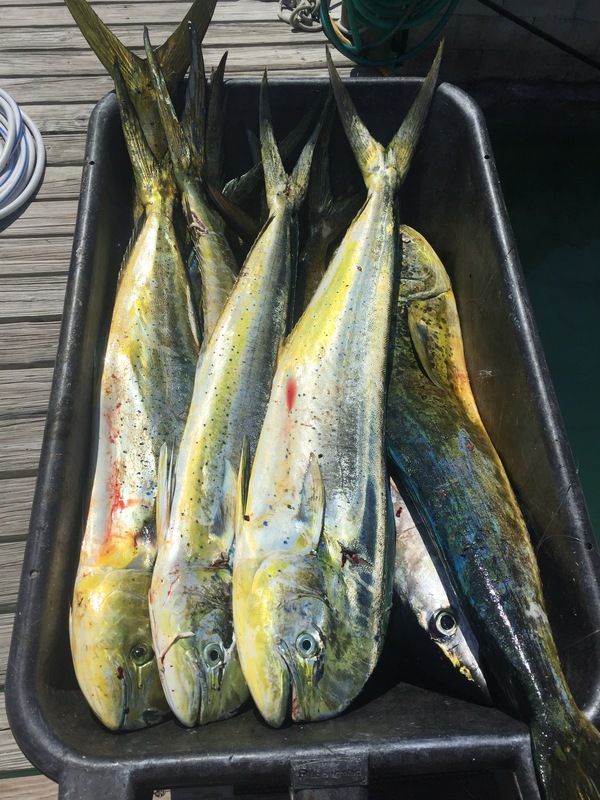 The day started off kinda slow without a bite until we got down the edge into Dolphin Head, then it was game on, mahi and mahi, all nice ones in the 18-24 pound range. 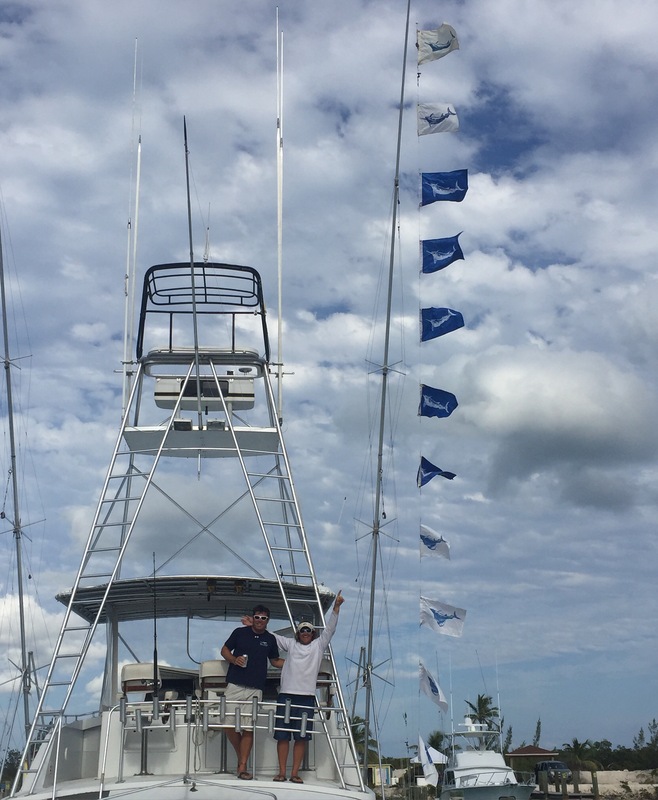 We managed to sneak a fun blue marlin release into the mix and shortly after a white marlin release. This was all before 10:30 am, and given that we have had a sailfish bite every single day we had been here, I thought for sure I was gonna get a Grand Slam today. We continued to catch mahi all the way down to the Caves and had a lot of pesky barracuda bites, but fishing was great. We never got another billfish bite but the action was HOT all day. Very fun day of fishing!